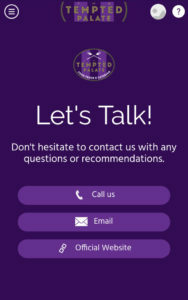 We are very excited to introduce The Tempted Palate mobile app! 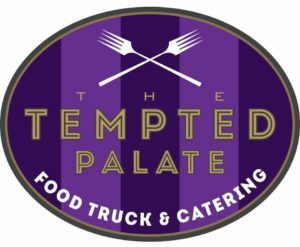 The Tempted Palate is a family owned food truck and catering service that specializes in authentic Cajun/Creole cuisine. The food truck visits locations all over metro-Atlanta and surrounding cities. We created a Progressive Web App and marketing materials to match the unique design flavor of The Tempted Palate as an extension of their official website. Here are a few of the top features enabled in the mobile app. We also coordinated with the owners to create printed marketing materials for table tents. The 5″ x 7″ acrylic tents are set out on the available tables at the food truck location to get the attention of new app customers. 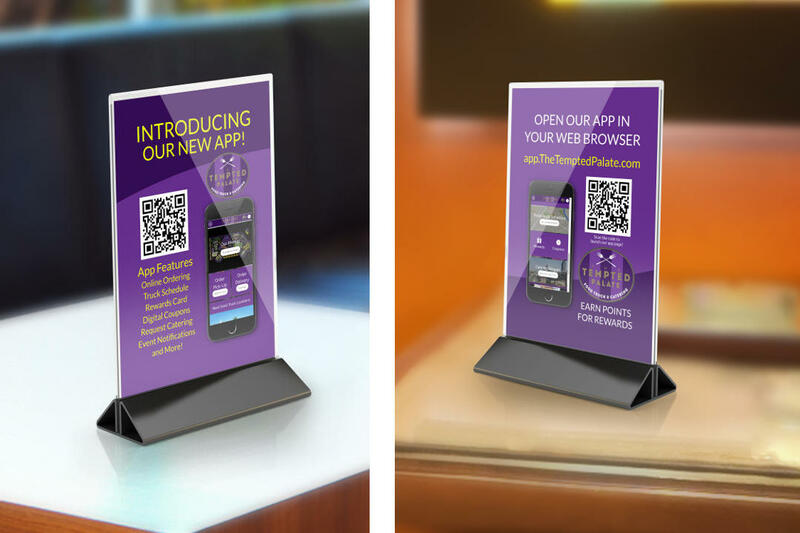 The design showcases the owners business logo, the top app features, and scannable QR Code to launch the app. To add a little more oomph to the marketing strategy, we also published three virtual tour photos from the Truck and Tap location in Woodstock. 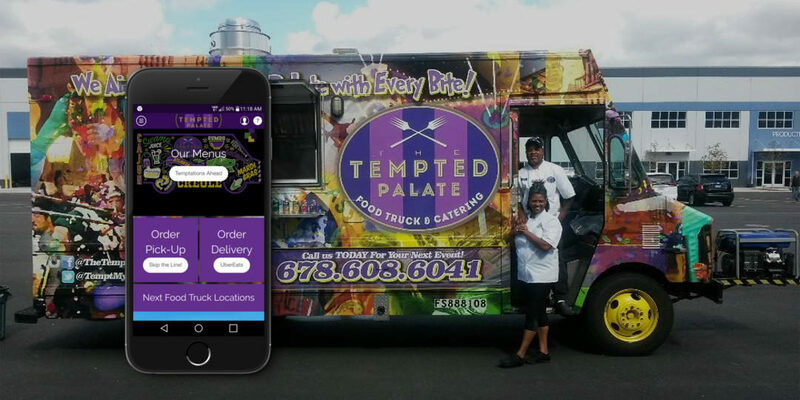 Here are the details of what went into the mobile app to streamline The Tempted Palate’s online ordering system and customer engagement features. Providing an easy and consistently reliable ordering experience is the top priority for any food truck. While The Tempted Palate offered UberEats delivery orders, their previous mobile app solution was unreliable. We integrated an ordering solution that links the owner’s Clover point of sale system into their main website and mobile app. Customers can order and pay in the mobile app or website and skip the line entirely. The Tempted Palate receives the order payment within seconds into their Clover system. Email confirmations are also enabled to ensure an order is never missed. Customers can easily add a tip during checkout. To provide secure online ordering, SSL certificates were added for encryption. 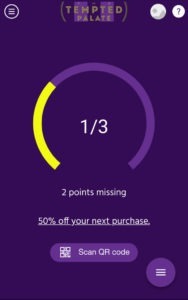 Customers can earn points on the mobile app rewards card. Once enough points are earned, customers receive a gift that can be redeemed at the food truck. Digital coupons are also enabled and scheduled at regular intervals. 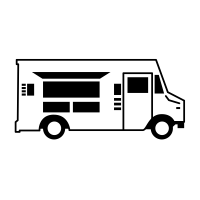 Certain coupons are redeemable at specific food truck locations. The food truck location is always changing around Atlanta. We make sure mobile customers never miss a nearby visit with easy visibility of the schedule and locations. The mobile app calendar combines the date, time address, and location details. It also adds powerful mobile features such as: Instant map navigation, one-touch phone calls, social media sharing, embedded video/audio content, and more. On the home screen, the next two upcoming locations are showcased. The full list of scheduled locations can also be accessed from the home screen or main menu. Push Notifications gives the owners the ability to send custom messages directly to their app customers. Scheduled messages can be triggered on specific dates and times. 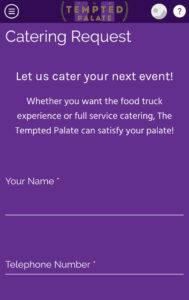 With The Tempted Palate app, notifications are sent ahead of the next food truck location change. The menu for a food truck is the first thing customers seek out. We brought the tempting menus to the top of the home screen and separated the menus into categories with several photos. We also included special dietary menus for Vegetarian, Vegan, and Gluten Free options. The owners have quick access to make updates to the menus as needed. Customers can instantly see the new menus. No further app updates are required. Customers have easy access to request catering directly through the mobile app. The request form gathers all of the important customer and catering details, which is then sent to the owners. The About Us section provides a personal introduction to the owners of The Tempted Palate. 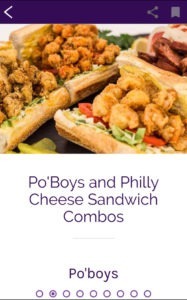 It tells the story of how they first met and their passion for making amazing Cajun/Creole cuisine. The Business Info section details the hours of operation and key business details. Online pick-up and delivery options are displayed. Dietary restrictions are included: Vegan, Vegetarian, and Gluten Free. The Reviews section showcases the top customer reviews from Facebook and Yelp. The owners of The Tempted Palate publish informative videos to their Facebook page and Youtube channel. The mobile app has a live Youtube channel feed to always display the latest videos. Customers have easy access to share, post, and review on The Tempted Palate’s social media pages. 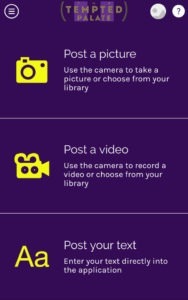 Customers can upload photos and videos of their food truck visit directly through the mobile app. Once approved by the owners, the media will be displayed for everyone to see and share. The mobile app provides quick access to contact the owners via phone and email. Many sections throughout the mobile app can be shared by customers to family and friends. These sections can also be added as Favorites (similar to bookmarks) to be kept for quick reference later. A section within the app provides assistance to new customers and provides instructions on how to navigate the app, creating an account, and how to make an online order for pick-up. 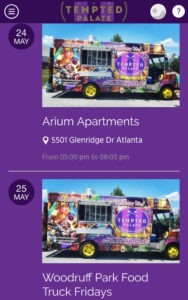 An affordable mobile app is the perfect marketing solution for food trucks and catering services.